I am very happy to see you here, folks! Welcome to In My Kitchen, the monthly gathering of global food bloggers. This is the place where we show off our latest lovelies in our kitchens, whether it be produce, gadgets, dishes we have made, or various kitchen sundries. Addendum to links for IMK: Inlinkz has changed its method due to the new EU data protection law, so I can no longer add links for other people. So, I will still have the inlinkz option up, but you have to either verify yourself through social media or create an inlinkz log-in. I think you only have to do that once! I will also have a list of IMK posts for those people who prefer not to log-in, so either comment with your details on this post, or you can email me with your post details and I will add it to the list. As host, I create my own post for In My Kitchen. It will appear on the 1st of the month. 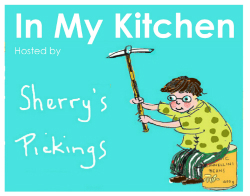 You create a blog post for your In My Kitchen items. At the bottom of your post, place the In My Kitchen badge, using the instructions below. Return to my In My Kitchen post. It has an Inlinkz LinkUp that you click on and link your post. More on that below. The monthly In My Kitchen LinkUp will be available from 1st (00:05) to 13th (17:00) of each month, Brisbane time. At the bottom of your post, with your editor in HTML (or text) mode, paste the code. This will add the badge to your post. Copy the URL of your IMK post. On my In My Kitchen post is a LinkUp, that shows when and how long the link is available. Click on it and enter the details it requests. This starts with your post's URL. It automatically detects your blog and allows you to select an image as the thumbnail. Email me and I'll add a link to your post in the body of the monthly IMK post. Cheers, good luck and see you here each month! That's fab! I hope everyone will add the badge eventually. Thanks for joining in. Cheers. Hi Sherry saw this badge which I will add when I get chance before next IMK. I will add you to the sidebar AIda as the linky thing has closed. (it's set to a certain time so I can't add anymore, I think).